The National Science Foundation (NSF) has awarded Sanford Research and Augustana College (Sioux Falls, South Dakota) a three-year, $320,000 grant to establish a Research Experiences for Undergraduates (REU) site for the exploration of topics in cellular and molecular biology. The NSF REU grant will offer $5,000 stipends to 10 students for participation in 10-week research programs. Campus housing is provided and participants will also receive a $750 travel stipend to attend national cellular and molecular biology conferences where they can display their research and learn from other scientists and researchers. Dr. David Pearce, vice president and chief operating officer of Sanford Research, a nonprofit research organization formed between Sanford Health and the University of South Dakota, and Dr. Seasson Vitiello, assistant professor of Biology at Augustana and an adjunct scientist at Sanford Children’s Research Center, are the grant administrators. “This collaboration puts us on a small list of the nation’s top research-focused organizations recognized by the NSF and designated as NSF REU program sites for undergraduate student researchers,” said Pearce, the principal investigator on the project. Sanford and Augustana have already demonstrated the ability to co-administer a successful undergraduate training program in the Sanford Program for Undergraduate Research (SPUR). SPUR, which was created in 2010 as a partnership between Sanford and Augustana, drew the attention of the National Science Foundation. The new NSF REU program will be administered in conjunction with the existing SPUR program, both of which will provide undergraduate students with a 10-week opportunity during the summer to apply their knowledge and skills gained in the classroom to the laboratory setting. The SPUR program is open to Augustana College students, while the new NSF REU program will be open nationally to students who normally may not be exposed to such an opportunity. 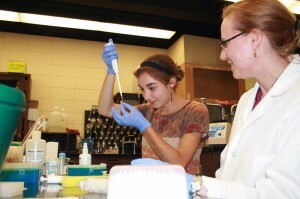 During the summer of 2013, 70 Augustana students are working alongside faculty researchers on campus and with research partners in laboratories, hospitals and research institutions throughout the U.S.
“Our existing SPUR program demonstrated that we were ready to expand opportunities for college students to explore complex topics in a unique, challenging environment, and this NSF grant will allow us to do that,” explained Vitiello. While Augustana has been an NSF grant recipient in the past, this NSF grant is the first in Sanford Research’s history. The REU site at Sanford Research and Augustana is just the sixth established in South Dakota and one of only 47 in cell biology across the nation.